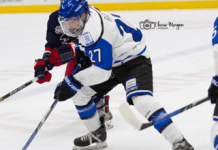 PENTICTON, BC –The Penticton Vees Jr. ‘A’ Hockey Club has acquired defenceman James Miller (98) from the Olds Grizzlys of the Alberta Junior Hockey League (AJHL), for forward Noah Jordan (97) and future considerations the team announced Monday. Olds isn’t an unfamiliar trading partner, as the Vees acquired forward Chris Gerrie (96) from the Grizzlys in an off-season move ahead of the 2015-16 season. Miller, 18, is entering his third season if junior hockey after previously spending the past two seasons in the AJHL. The Spruce Grove, Alberta, product had five goals and 21 points in 50 games last season, nearly doubling his point total from his 16-year-old rookie season in 2014-15. In 90 career regular season games, he has seven goals and 32 points. Last season Miller was part of Team West for the 2016 CJHL Prospects Game in Surrey, BC. Before he broke into the AJHL, Miller played both midget and bantam hockey for his hometown Spruce Grove PAC Saints. The rearguard has already secured an NCAA Division l commitment to the University of New Hampshire for the 2017-18 season. Jordan, 19, scored once in six games for the Vees, after coming to Penticton from the Ontario Junior Hockey League’s St. Michael’s Buzzers in an off-season trade. Last season with the Buzzers Jordan notched 12 goals and added another 44 points in 50 games. Miller will wear number 19 and make his Vees debut on Friday, September 30th, when the team makes a visit to West Kelowna, to face the Warriors at Royal LePage Place.